Vert Kitchen is a Denver restaurant that aims to let its patrons enjoy fresh food made with the best ingredients, whether dining in or taking out. Owner and Chef Noah Stephens opened Vert Kitchen in 2009 after extensively traveling across Europe and completing culinary school. During his time working in a small restaurant in France, Chef Stephens truly learned the importance of using only the best locally sourced seasonal ingredients. Chef Stephens carried this knowledge with him back to the United States when he decided to open Vert Kitchen in Denver, Colorado. The menu at Vert Kitchen is a testament to the desire to provide the public with a good food that is made with the best ingredients possible. Reservations are not required to dine at Vert Kitchen. Patrons are served on a first-come first-served basis. Vert Kitchen offers a simple menu that includes an assortment of delicious food options for breakfast, brunch, and lunch. Some of the menu items have a French flair, owing to the extensive time that Owner/Chef Stephens spent in France while completing culinary school. The following are a few of the menu offerings. · Breakfast - An assortment of breakfast sandwiches. · Brunch - Offering such as frittatas, avocado toast, and a variety of croque dishes. · Soups and Salads - Soups served solo or with one or two sides, several varieties of salads as well as the option to make any sandwich into a salad. 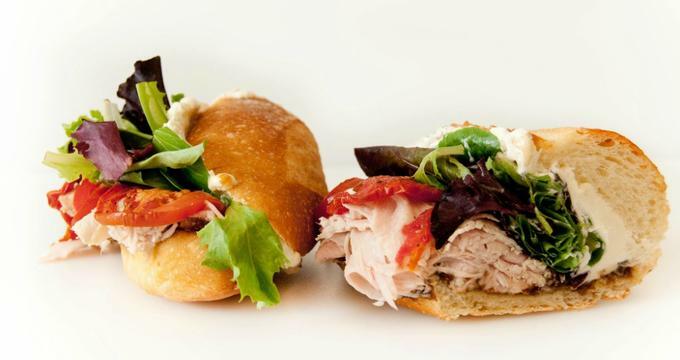 · Sandwiches - An assortment of sandwiches, from pork shoulder to chicken curry. · Kids - Kids get the option of two sandwiches served with juice, fruit, and cheddar bunny crackers. · Wine - An assortment of white, red, rose, and sparkling wines as well as cocktails and beers. Vert Kitchen offers a box lunch service, which is a great way for people to experience the delicious menu at Vert Kitchen. These box lunches are simple yet delicious and very filling. They include one of the signature sandwiches on a baguette roll, a side salad, natural chips, and a homemade cookie. In addition to box lunches, Vert Kitchen also offers lunch platters. A full box lunch menu and order form is available on the Vert Kitchen website. An assortment of Vert Kitchen foods, such as sandwiches, wraps and salads, is available at local stores throughout the Denver area. Patrons are encouraged to check the Vert Kitchen website for an updated list of vendors that carry Vert Kitchen food. Patrons can also use the website to request for a vendor to carry Vert Kitchen products. Guests can rent out the patio or the entire space at Vert Kitchen for private dining events and special occasions. Vert Kitchen also offers private chef services. Interested parties can obtain more information about these services by contacting the restaurant directly at (303) 997-5941.